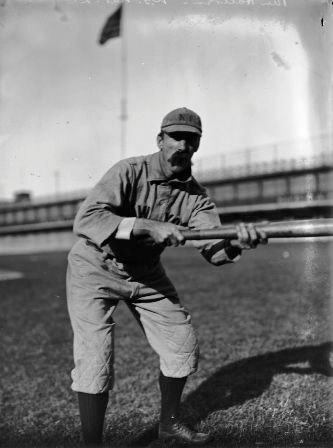 Until a broken ankle in 1902 slowed him, George Van Haltren was one of baseball’s best leadoff hitters; a .316 hitter with 2544 hits during his 17 seasons. After a disappointing 1903–.257 in 84 games—his major league career was over, and he went home to the West Coast where he spent six seasons in the Pacific Coast League (PCL). “Never take any stock in such twaddle. These place-hitters would be just the men to have around when the ‘fans’ are calling on the home team to ‘hit ‘em where the fielders ain’t!’ But when it comes to delivering the goods, I have noticed, they are generally short. “As a matter of fact, the batter often tries to hit to a certain field, and sometimes he is successful, but no man can give a guarantee when he goes up that the ball he hits will take any special direction. If place-hitting could be carried out to the fine point that some players say they have it, they would be able to hit safely every time they came up. “To the young player I would say: Don’t get in the habit of planting your feet on the ground and not moving them until you have swung at the ball. Get a stride and advance a little toward the ball as you hit. Do not step too far and accustom your eyes and hands to the change such a step makes. Learn to hit squarely every ball that passes over any part of the plate between the knee and shoulder, and devote the most practice to what you are weakest on. By the time he arrived on the West Coast, Van Haltren was no longer able to give his opponents “a surprise” as often as he could before the ankle injury; he hit .270 for Seattle in 1904, he played five seasons with the Oakland Oaks, hitting .255 before retiring in 1909. Van Haltren died in 1945 without ever drawing serious Hall of Fame consideration. A good argument for his enshrinement can be found here. Franz Philip Hosp Jr. was born in Cincinnati in 1884 (some records, including cemetery documents and his grave say 1883). His father was a well-known landscape architect and horticulturist who moved the family to Riverside, California in 1888. The elder Hosp was responsible for many projects in the Southwest and Southern California; he is probably most famous for his landscaping of Victoria Avenue in Riverside, which remains a tourist attraction and is listed on the National Register of Historic Places, and for planting the gardens at the El Tovar Hotel in Grand Canyon National Park. The family also ran a successful nursery in Oceanside, California and Hosp worked with his father while playing baseball in the San Diego area. The Los Angeles Herald said two teams, The Butte Miners and the Seattle Siwashes of the Northwestern League, had already “tried hard to secure his services,” when he pitched against the Los Angeles Angels of the Pacific Coast League (PCL) in a February exhibition game in San Diego. Hosp said he chose to play with Los Angeles so he could continue working at the family business in Oceanside. Hosp was 12-7 with a 2.73 ERA for the PCL champion Angels in 1907; he also played 13 games in the infield, hitting just .105. 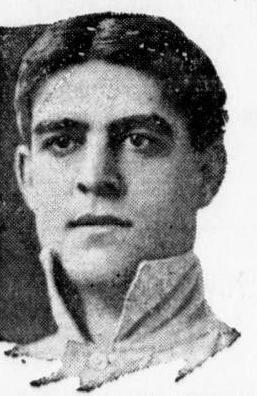 (Just more than a year later, August 28, 1909, Hosp’s former teammate Dolly Gray, now a 30-year-old rookie with the Washington Senators, set the major league record by walking eight Chicago White Sox batters in one inning). Hosp was 16-14 in August of 1909 when he was signed by the Cincinnati Reds for 1910. Within a week he hurt his arm and did not pitch again for the remainder of the season. By the spring of 1910 there were conflicting reports about the condition of Hosp’s arm. When finally given a chance to pitch, against the Boston Red Sox on March 25, after two scoreless innings, he gave up four singles and doubles to Harry Lord and Tris Speaker, in the third, resulting in three runs and was lifted for a pinch hitter the following inning. Hosp was also tried in the infield where he “has made a fine impression.” But it wasn’t enough to stick with the Reds. The paper was wrong, the extent of Hosp’s activity as a pitcher after that game was four innings in three games over the next year and a half. Hosp was released by the Angels on June 15, along with Briswalter, who The Times claimed four months earlier had said Hosp’s arm was shot; Briswalter had not recovered from a hip injury sustained during the 1909 season, he developed Tuberculosis of the injured bone and died in 1912. Hosp continued to play for a decade. Hosp became the team’s regular shortstop, through their move to Venice, California. He hit .261 in 1911, and 1912, .255 in 1913, and then slipped to .208 in 1914. He was released before the 1915 season and played for the Wichita Witches in the Western League. He returned briefly to the PCL at the end of 1915, but was released by the Oakland Oaks prior to the 1916 season. He returned to the PCL in 1918, playing for four teams over the next three seasons, ending his career after 56 games with the Salt Lake City Gulls in 1920. Hosp returned to Southern California where he played and managed for semi-pro and industrial league teams and lived in Los Angeles. On June 30, 1928 he was killed in a car accident on Coast Highway (US 101) 16 miles north of Oceanside. 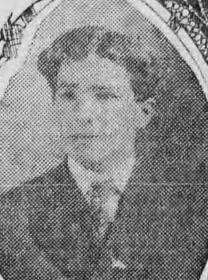 Leonard A. Wattelet‘s professional career lasted just two games as a 19-year-old with the Seattle Siwashes in the Pacific Coast League in 1906. He continued playing in amateur and semi-professional leagues in Texas and California, until 1911 when he gave up playing for management, and purchased an interest in the Victoria Bees in the newly formed Northwestern League. The Sporting Life called him “the youngest magnate in baseball,” and during his first two seasons with the organization he served as secretary, business manager and treasurer of the team and became president after the 1912 season. 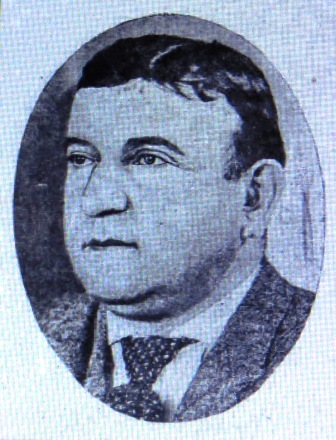 Wattelet and his partner sold the team at the beginning of the 1914 season, and he remained a club executive through the end of the 1915 season. In August of 1917 he was commissioned a captain in the Officer’s Reserve Corps and sent to Camp Lewis, Washington where he was placed in charge of the camp’s baseball program. Many current and former big leaguers played at Camp Lewis under his leadership including; Ralph “Hap” Myers, Jim “Death Valley” Scott, John “Red” Oldham, John “Duster” Mails, Lou Guisto, Charlie Mullen, Harry Kingman, Charles “King” Schmutz, and dozens of West Coast professionals. In 1918 Wattelet went to France with the 364th Infantry Regiment, 91st Division, U.S. Army. On October 31, 1918 he was killed in action and was buried at Flanders Field American Cemetery in Belgium. Word of his death did not reach the states until December 7. Whether the reported deal was actually promised to Frick is unknown. While he returned to Oklahoma City he never joined the Mets and finished the season with the Wichita Jobbers. 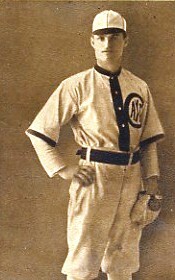 In February of 1906 Frick was awarded to Wichita then immediately traded to the Toronto Maple Leafs in the Eastern League. He spent the next five and a half years in the Eastern League with Toronto, the Baltimore Orioles and the Newark Indians. He did return at the tail end of the season, but only appeared in a few games. In 1911 he was sold to Newark, and after hitting just .200 in 28 games he was sold to the Troy Trojans in the New York State League. Before the 1912 season, Harry Wolverton, third baseman and manager of the Oakland Oaks in the Pacific Coast League, was named manager of the New York Highlanders in the American League. 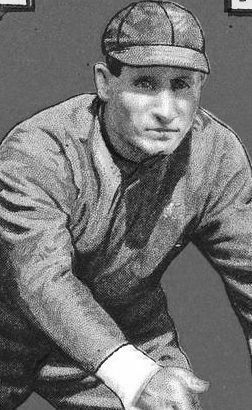 Oakland hired Bayard “Bud” Sharpe to manage the team; one of his first moves was to purchase Frick from Troy to fill the void Wolverton left at third. By March 7 The Associated Press said Sharpe was “somewhat exercised about infielder Frick.” The new third baseman had arrived in Oakland by train several days earlier, but had not arrived at the Oaks training camp in Livermore, California and had not been heard from him. Sharpe showed up the following day, but it was reported he had spent several days in an Oakland hospital—it was not reported why he was hospitalized. Frick began the season as the Oaks starting third baseman, but after hurting his foot in April, August “Gus” Hetling filled in and Frick never returned to the regular lineup. As with his spring disappearance there was no mention as to why Frick was in the hospital. Frick was with the team on October 27 when they took both games of a double-header in Los Angeles; Vernon won both games of a doubleheader from Portland, and Oakland took the pennant with a winning percentage of .591 to Vernon’s .587. Frick saw little action in the final weeks of the season, his replacement Hetling hit .297 and was awarded a Chalmers Automobile as the league’s most valuable player. The Portland Oregonian said Frick had been “ill and despondent,” and said he was suffering from “brain fever.” (Brain fever is an antiquated and vague term used for inflammation of the brain).